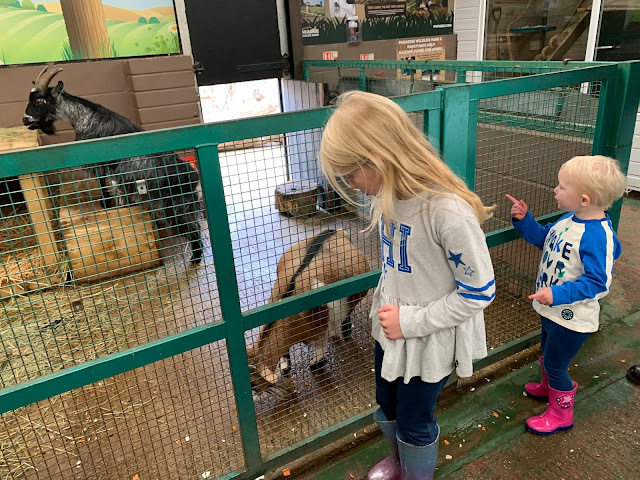 It was a cold Sunday morning when we headed to Paradise Wildlife Park to see what was new. Along with lions, tigers and other big cats at the attraction in Broxbourne, Hertfordshire there are meerkats, tapirs, camels, dinosaurs… Yes that’s right I did say dinosaurs, because Paradise Wildlife Park isn’t like your standard zoo, one side of the park is primarily animals (from the exotic to the farmyard) the other side has a large play area, soft play, splash park, museum of speed and since Easter 2018 a dinosaur area with 30 moving dinosaurs. That means there is plenty to do to keep little ones running around and hot drinks to warm up the big people. What is there to see at Paradise Wildlife Park? You will find World of Dinosaurs very close to where you enter the park. If you walk past the entrances to Paradise Lagoon (paddling pool) and Speedway Museum, the huge entrance to World of Dinosaurs and the dinosaur teeth on the right hand side might just be enough to stop your children noticing the soft play you are walking past and the play areas ahead. 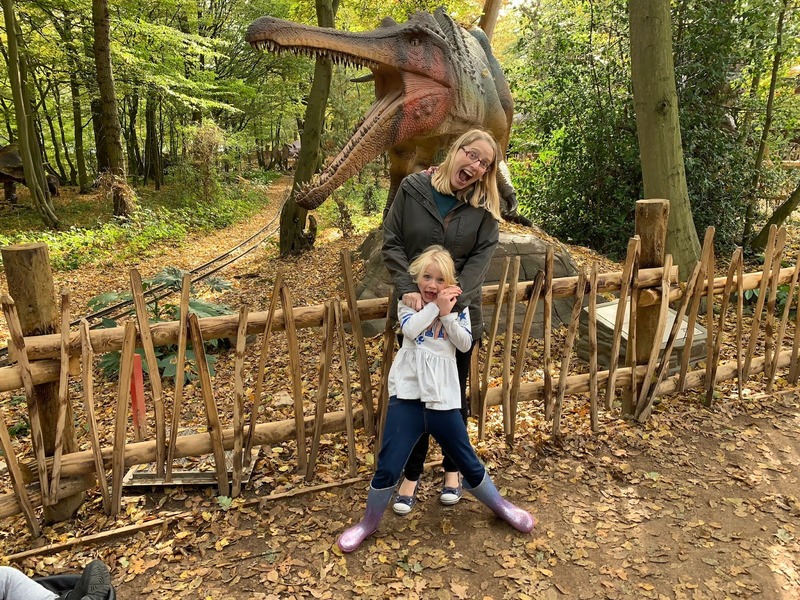 I remember queuing up years ago at the Natural History Museum to see a few moving dinosaurs, in contrast Paradise Wildlife Park has 30 moving dinosaurs (apparently, I didn’t actually count) and some of them are huge. The dinosaurs look fantastic from a distance and as you walk past (thanks to subtle movement sensors) they start to move and make noises. All though my experience of being face to face with real dinosaurs is rather limited I think they are impressively life like, you can even see their ribs move. The dinosaurs don’t seem to be too scary though because my 2 year old was happy to go on the short walk round the enclosures to see all the dinosaurs, but I couldn’t persuade her to stand next to a fence to have a photo taken with her sister and I. Oh and watch out for the one at the end, it spits. You exit via a shop with lots of dinosaur (and bizarrely unicorn) products and you can also buy hot and cold drinks and snacks. 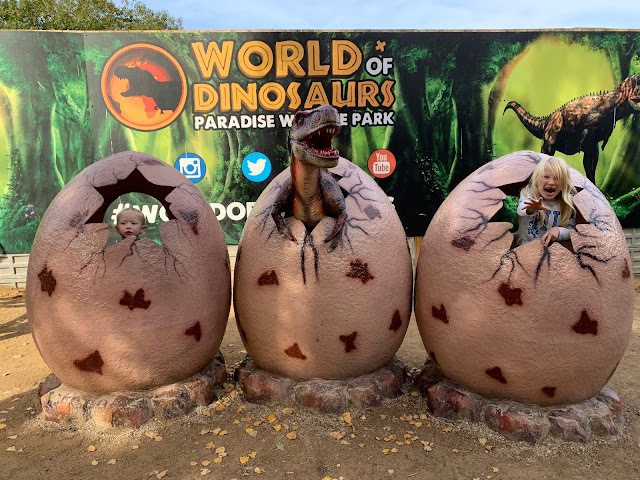 Just outside there is a sand pit (Dino-dig), a few picnic tables and some oversized dinosaur eggs perfect for photos of your little dinosaurs hatching. Next to the World of Dinosaurs is the miniature train ride which has been reinvented as the Rex Express. 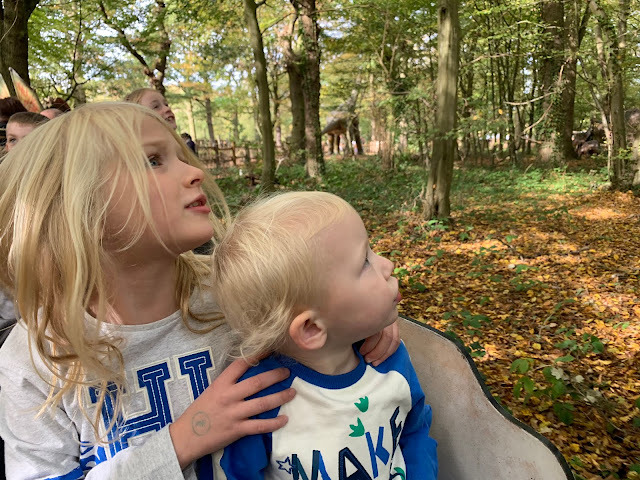 Train rides are always entertaining for children and as well as going through the woods where you see real wolves and reindeer the train ride takes you close to a couple of the dinosaurs you wouldn’t otherwise see. The train costs £2 per person (for over 2s) and my partner and I were divided on whether it provided good value or not. Our girls really enjoyed it, but I would probably leave my partner on the platform next time! You can also see the wolves and reindeer on foot by going through a woodland entrance just beyond Pirates Cove (one of several play areas). 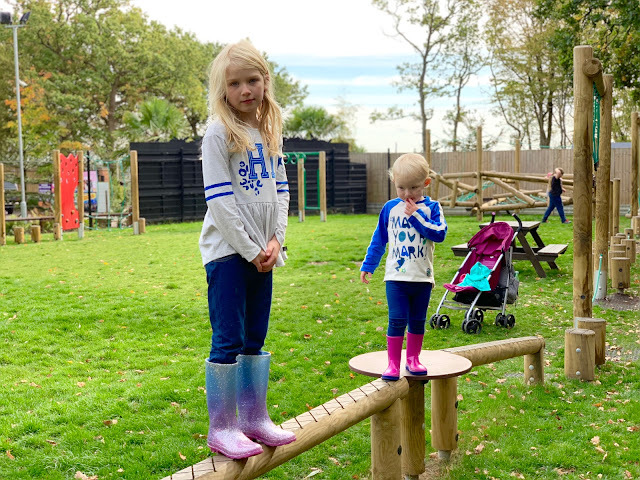 I’m sure it’s not just my children who are often more interested in the play areas in zoos than the actual animals? 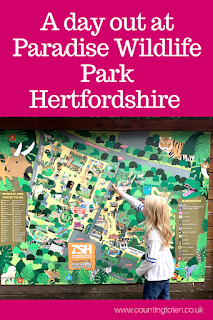 I suspect there are some families who go to Paradise Wildlife Park who never actually make it into the Animal Park. In the main play area there is a train, fire engine and pirate boat children can climb on and play with as well as swings, slides and an obstacle course. A new addition for this year has been the replacement of some inflatables with a climbing frame suitable for younger children which is a nice addition. 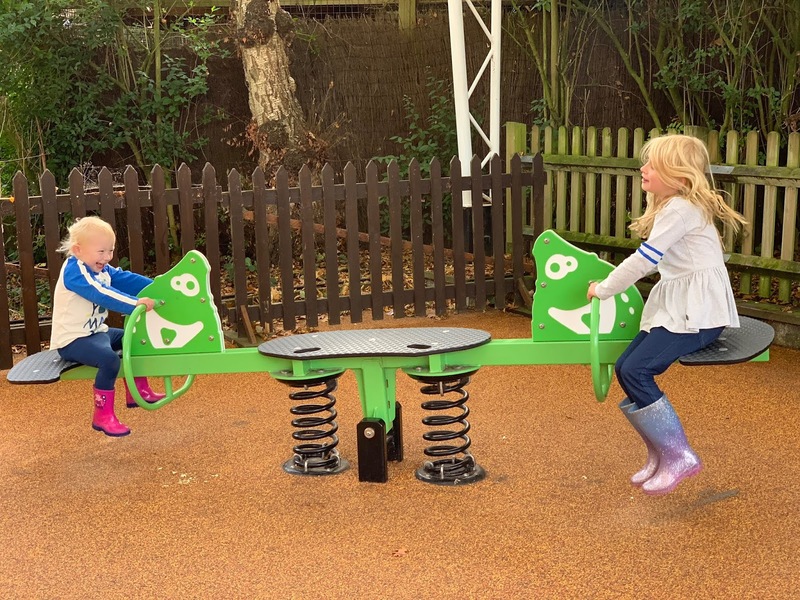 There is also an enclosed play area for children with additional needs. 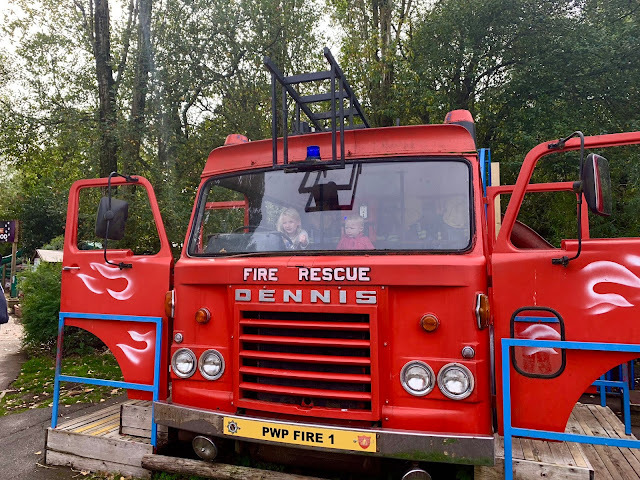 On the other side of the park there is the Monkey Mayhem play area with a long slide, helter skelter and a few other bits to climb on, then there is Dumbleby Forest with several swings, a fire engine, gypsy carriage and playhouse. 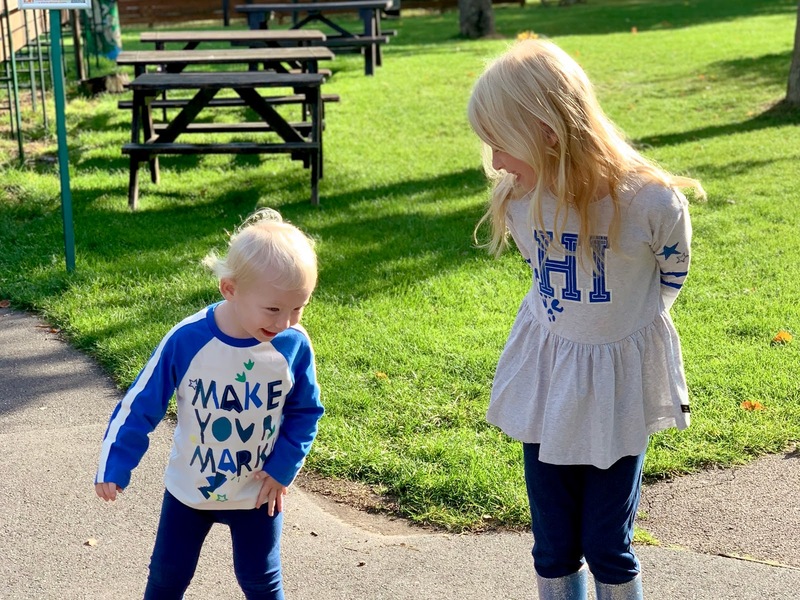 There is also miniature golf (for an additional charge) and Tumble Jumble, a soft play which is perfect for the colder or wetter days when you need to warm up. The Animal Park is located on the other side of the road from where you enter the park accessed via a manned crossing (and gates to stop children crossing when it isn’t safe). When you have managed to get your children past the mini arcade and Monkey Mayhem you can go left towards the Discovery Centre, walk round the pond and you will find yourself at the Bird park. This area has lorikeets you can feed and a bird show arena at advertised times. 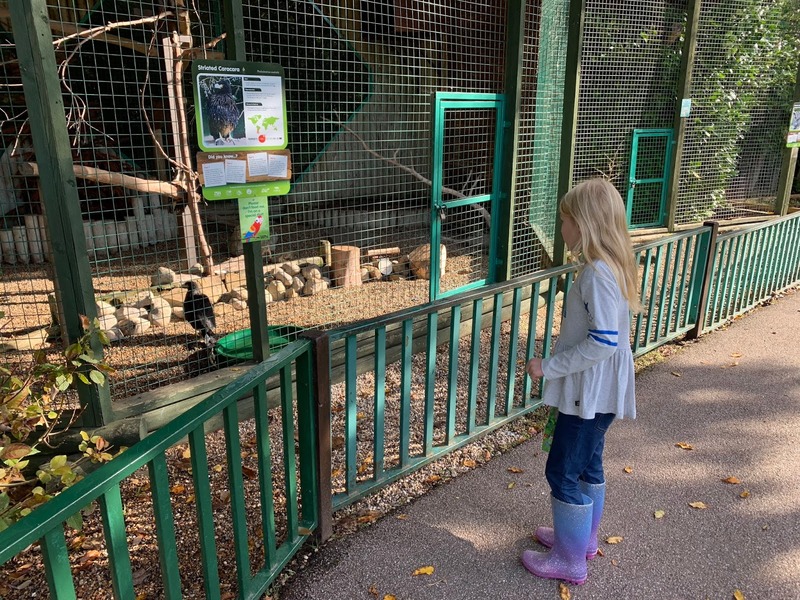 There are also a number of enclosures primarily containing birds such as owls, macaws etc as well as a skunk (which was hiding) and tortoises (which you could see through the windows into their houses despite the cold weather). If you retrace your steps out of the Bird area and take the other route you get to the Animal Park. 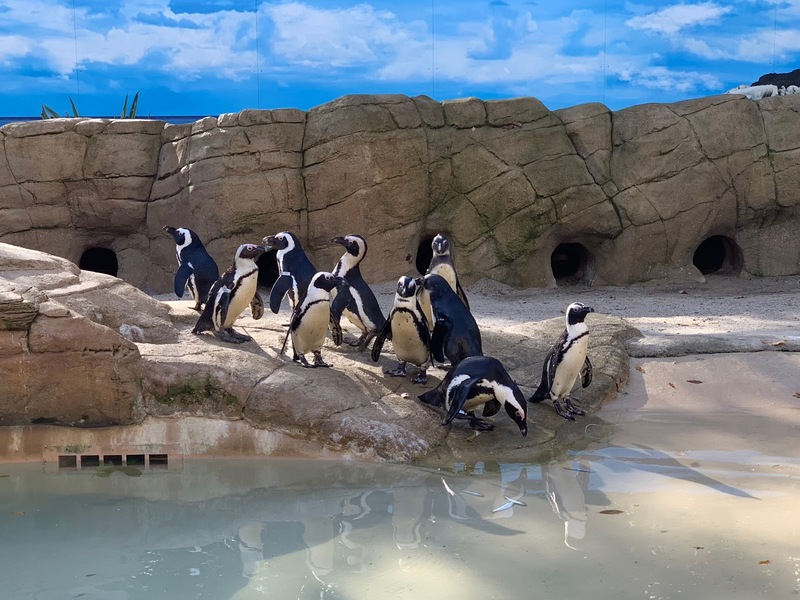 Compared to Zoos like Colchester the animal area is fairly small, but it contains a large number of animals and a good variety too. You won’t find anything larger than a Zebra, so no Giraffes or Elephants, but they are the only place in the UK which is home to all 5 Big Cats (Jaguars, Leopards, Snow Leopards, Tigers and Lions). 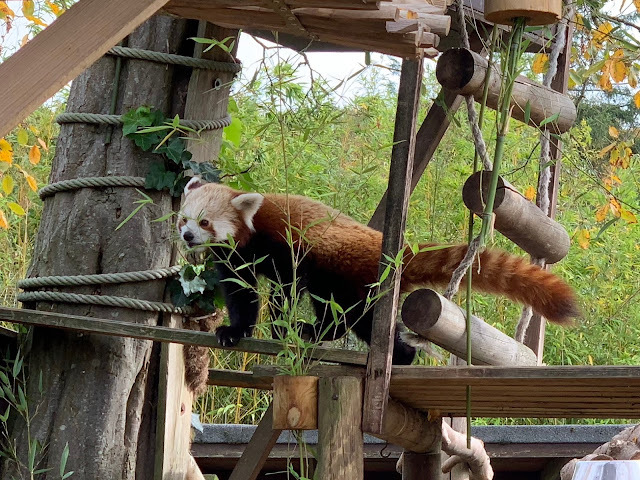 Other Highlights of the Animal Park for us include the Outback Trail walk through, the Red Pandas, the Otters, Lemurs (especially the Red Ruffed Lemurs) and the Gibbons. 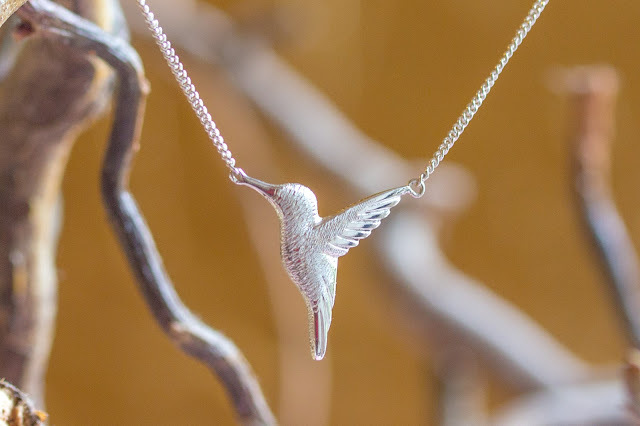 But there are over 500 animals so everyone will find their own favourites. 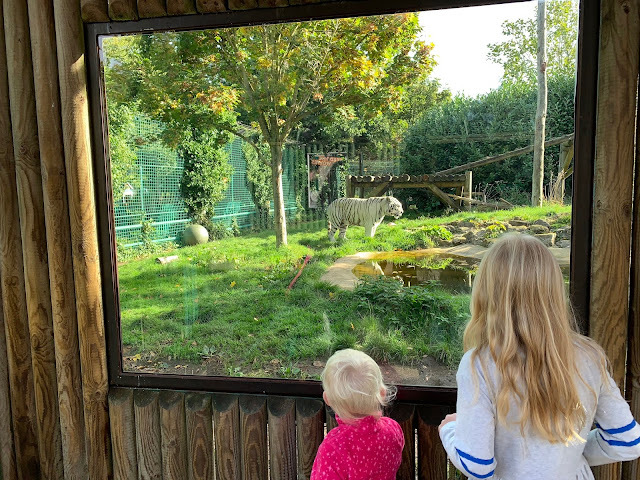 You can see the Big Cats from the ground as well as raised walkways (which are wheelchair/ pushchair accessible from one end) and there are also raised areas for viewing the white tiger and penguins. You can buy bags of animal feed for some of the animals (mainly those in the farmyard). You can even feed Lions, Tigers, Lemurs and Wolves if you pay for the experiences (prebooking recommended). All the animal experiences can be booked at a 50% discount if there is any availability on the day you visit, but you will need to book if you want to be sure to do any of them, and a little way in advance for peak times. 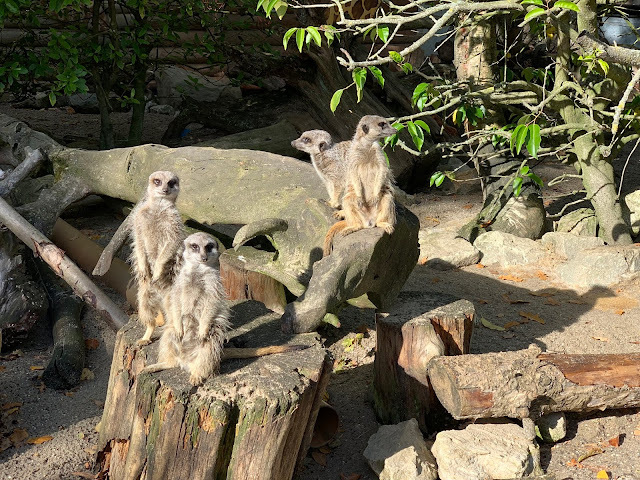 There are minimum age limits for most experiences, but my 40 odd year old partner loved feeding the red ruffled lemurs a few years ago so I would recommend checking out the options. Make sure you check the map to ensure you have seen all of the animals as there are multiple ways round and you don't want to miss any out. 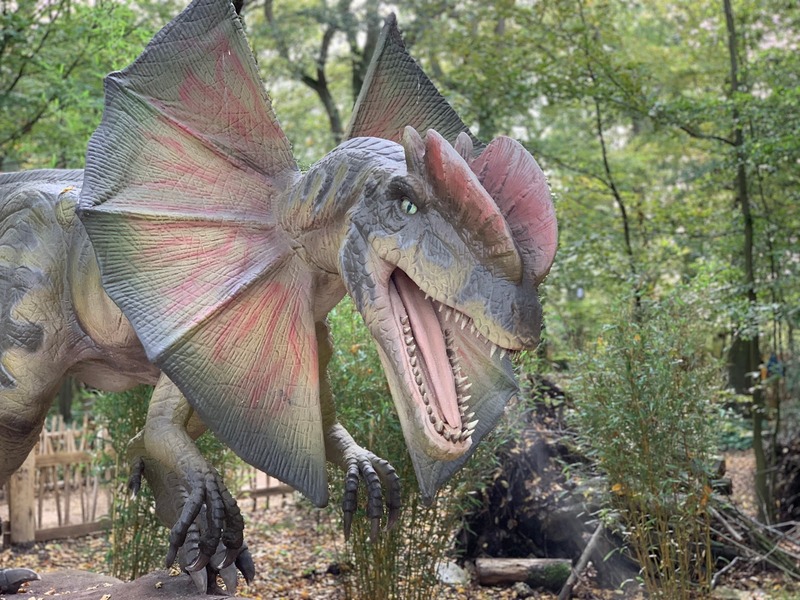 Most of the main food outlets are on the World of Dinosaurs side of the park. There is food and drink available in the soft play, the dino shop and the main restaurant which sells a variety of hot meals and sandwiches. At peak times Smoking Sams BBQ sella some barbecue style food near the Safari Stage. There is a good amount of seating inside the main restaurant as well as outside near the stage where entertainment is available at peak times. Over the other side of the park there are a few additional outlets selling drinks, snacks and ice creams, but opening hours seem to vary depending on how busy it it. These include Tiger Tree Tops where you can have a prebooked experience of Big Cats Breakfast or Afternoon Tea With The Tigers experience. If you choose to bring your own food there are picnic tables scattered throughout the park and a large undercover picnic area near the Paradise Lagoon. 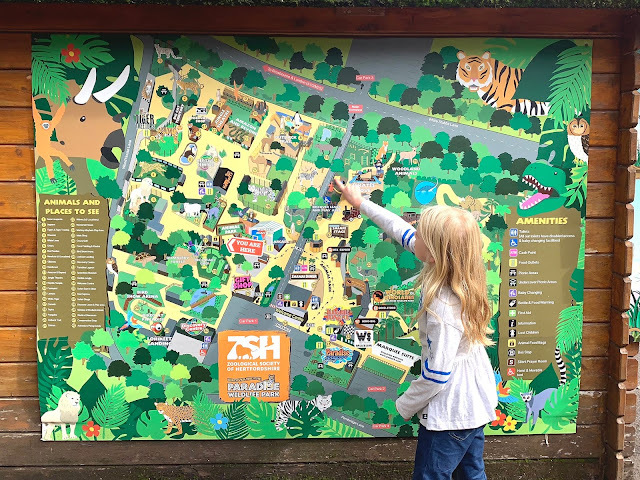 Toilets: There are toilets in the car park before you go in, on your right (opposite the soft play) after you go in, inside the restaurant and in the middle of the animal park. If you have a little person who needs the toilet urgently you might want to remember the locations as you can be some distance away from one. I like that the loos all have a child's toilet seat option and there are low sinks and changing rooms too. The toilets aren’t the plushest I have seen, but they do the job. There are several car parks, 2 near the entrance and a further 2 (overspill car parks) on the other side of White Stubbs Lane, but you will be directed on where to park when you arrive. 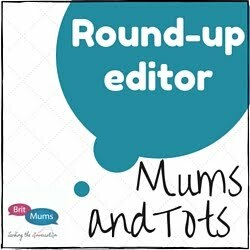 You can hire little tikes style cars (£2.50 for an hour or £5 for the day) if little legs need a rest. 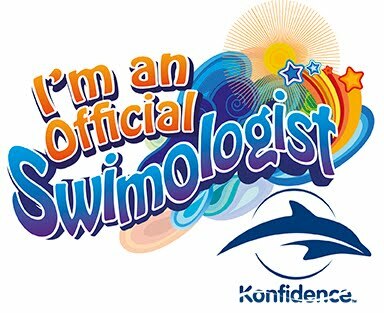 You have to pay an entrance fee for anyone 2 or over and you can get a small discount by booking in advance online. 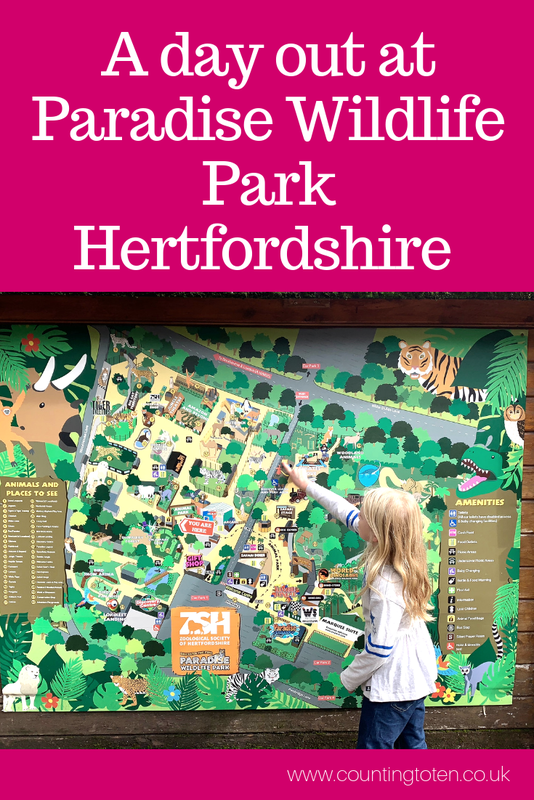 I have been to Paradise Wildlife Park at least once a year for the last 6 years. I have loved to see the continued investment making the destination more interesting for visitors as well as better for the animals. Over the years the number of animals appears to have reduced, but the quality of their enclosures has improved. 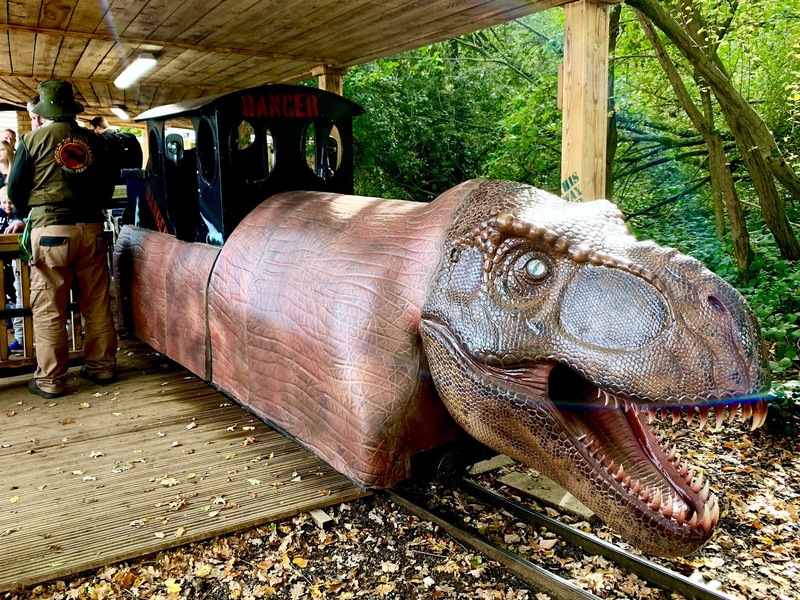 I’ll admit to being disappointed at the loss of the go-carts and giant lego which are now replaced by the Dinosaur shop and cafe, but the dinosaurs are definitely going to encourage more visitors to the Park. It continues to be a lovely day out for families with young children.